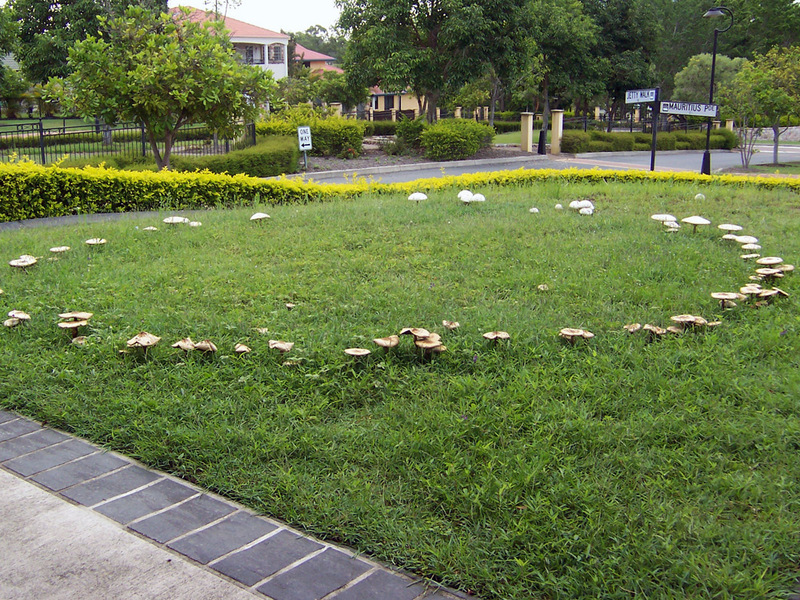 A fairy ring is a circular ring seen most often on lawns or grassland. They appear as a ring shaped brown or dead patch often with a bright green strip of grass at the inner and outer edges of the ring. They are caused by a fungus growing and feeding just below the surface of the lawn. Often a fairy ring will start producing mushrooms above ground any time from July onwards which will confirm its presence. They start small and grow outwards at a variable rate depending on temperature, situation and local conditions, they can grow at several inches to several feet per year. It is a single fungus growing outwards as i uses up nutrients from its starting point. The fungus does not directly attack the grass plants. Its mycelia (threads of fungal growth) penetrate the soil to a depth of 3 to 12 inches. The mycelia are hydrophobic (they shed water) and grow very densely. The grass immediately above this mycelial mat eventually dies from lack of moisture. There may also be a ring of more lush growth as the fungal mycelia release nutrients into the soil that the grass immediately nearby usues for its own growth. The good news about fairy rings is that the mushrooms produced are often of an edible type, any one of three species (this applies to the UK - but check with a fungus ID book before you try them!). The bad news about fairy rings is that they are very difficult to remove. 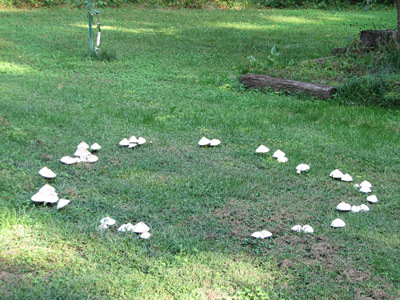 Fairy rings are circles of fungal growth beneath the surface of the soil, when the fungus produces fruiting bodies, mushrooms or toadstools, the ring becomes very clear. 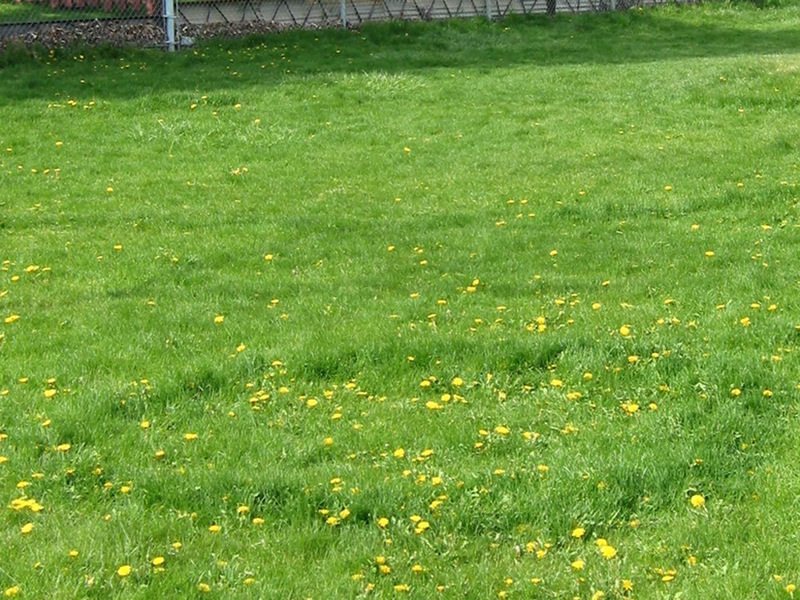 Fairy rings occur naturally in woodlands and grasslands, they occur world-wide and are no respecters of your well manicured lawn. 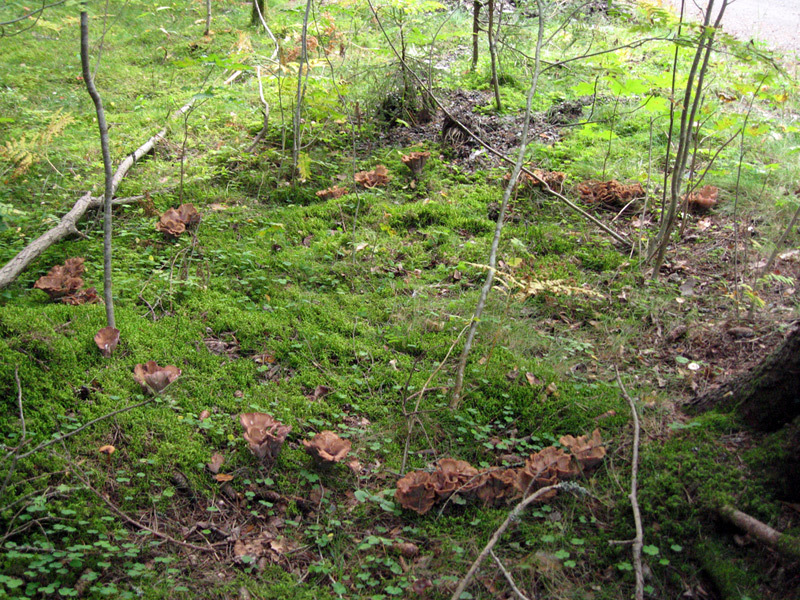 Most of the time, the fruiting bodies of the mushrooms or taodstools are not visible, though the ring can still be seen by a circle of particularly strong or poor grass growth. A toadstool fairy ring in light woodland, in nature they are often not especially visible when not fruiting, our carefully cut monoculture of grass lawns shows them up to best effect. How do I get rid of a fairy ring? - The short answer is - with great difficulty. Dig up and replace the soil to 12-18" depth and 12" either side of the ring (throw the old soil away - down the tip). This removes the fungus that intertwined with the soil along with the soil. If any of the fairy ring fungus contaminated soil or turf is spilled on healthy grass it could start the fungus off again in that location. Armillatox can be used to sterilize the soil - after digging and burning the turf and soil to a depth of 9". I'd wait to see the mushrooms first though to confirm that you do have a fairy ring before you begin anything so labour and time intensive. Fairy rings can be controlled with a copper based fungicide or one based on benomyl, eradication by this means is unlikely - a wetting agent added to the fungicide (a little washing up liquid) and / or holes made with a fork or aerator will help the water penetrate as it has a tendency to just run off. Remove the mushrooms as they appear whether you eat them or not to prevent the problem spreading. Feeding the lawn also helps to disguise the problem which is usually more obvious on an underfed lawn. It is possible to fumigate fairy rings. This is a major process and requires turf to be removed two feet on the inside and outside of the ring. The soil is then loosened to a depth of 6 to 9 inches and a soil fumigant applied. The treated area is covered with a plastic sheet and left for 2 weeks or more depending on the temperature. Fumigants are powerful chemicals and can burn through clothing, skin and lungs, needless to say they should be used with extreme care or more preferably a professional contractor hired. They are not exactly an environmentally friendly approach as just about everything else in the soil is killed as well. Kill off or dig up the turf and then rotavate the fairy ring infected area in several directions until the soil is thoroughly mixed. This uses the self-inhibiting metabolites produced by the fungi. Mixing these materials together may prevent the regrowth of the fairy ring, it also works for several rings that meet together as the chemicals from each inhibit the others. 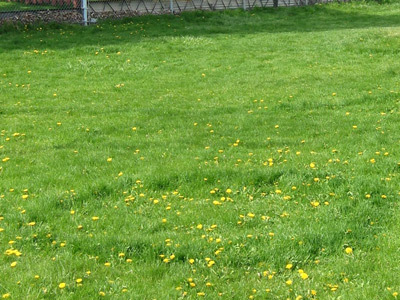 Autumn or spring are the ideal times to feed your lawn. Collecting the grass and removing it each time it is cut means that nutrients need to be put back or the lawn will slowly deteriorate. Feeding the lawn also helps gives the grass the edge over weeds and especially any moss that may be competing with the grass. A healthy lawn is better able to survive attacks by pests and diseases, be resilient to foot traffic and make it through periods of challenging weather such as heat, cold and drought. Lawn scarifiers - Scarification or lawn raking is the removal of "thatch" from a lawn. Thatch is the name given to the dead organic material that forms just above the soil surface and below the grass leaves, it can also often contain a lot of dead and live moss that will compete with and possibly over-grow your grass. A job that if done once every two months or so through the spring and summer will go a long way to maintaining the health of your lawn and help keep it looking its best. Lawn mowers - To keep healthy a lawn needs to be cut well on a regular basis. A good lawnmower that is up to the job makes this task easier and if it is easier, you are more likely to do it more regularly. Make sure the mower is up to the job power-wise for your size of lawn and is large enough for you to cut the grass without taking too long about it. A mower that is up to the job will also last longer than a smaller struggling version as it gets less wear each time you use it. Fairy rings form most often in soils with high organic matter, or in lawns with a thick layer of thatch (dead grass, moss and clippings between the grass blades and the soil). Scarifying to remove thatch and core aerating to help its breakdown are helpful as they deny the fungus its foodstuff. When preparing soil for seeding or turf, any large sources of non-composted organic matter such as tree stumps, wood building materials, etc. should be removed as they provide a food from which fairy ring fungi can spread. Good turf management and lawn health goes a long way to avoiding fairy rings. Fairy rings most often put in an appearance once spring is under way about May time. They may initially be egg shaped and not meet to form a ring. As time goes by they expand outwards but the same thickness (around 15cm, 6 inches) like a smoke-ring. You may see it as a double ring of dark green grass that produces a crop of toadstools. Sometimes fairy rings may meet up, but they never overlap, chemicals produced by the fungi inhibit the growth of the others, so they touch and stop. Q. I have had a patch of brown appearing in a horseshoe shape on my lawn for 2 yrs in a row. Last year I thought I had cured it by re-seeding, but the horseshoe is re-appearing - even larger than ever (outside the previous year's perimeters). It may even join up in an egg shape ring. I never had this problem before last year, but I do tackle moss with weed & feed. What causes this & what can I do please? A. It sounds like you've got the beginnings of a fairy ring. This is a ring of fungus growing and feeding just below the surface of the lawn. Characteristically there is a brighter green strip of grass on the edges of the dead or brown patch. If it is a fairy ring then it will start producing mushrooms above ground any time from July onwards which will confirm it. How to deal with it - see above.